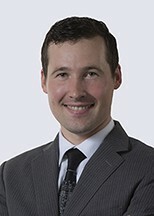 Andrew Schmid is an intellectual property attorney focusing on worldwide patent procurement. His practice involves mechanical, electromechanical, and computer related technologies including distributed systems, artificial intelligence, encryption systems, telecommunication and networking systems, transcoding and media content recognition, graphical user interfaces, control systems, consumer electronics, robotics, vehicle diagnostics, textiles, and athletic equipment. Prior to Honigman, Andrew conducted technology licensing for engineering departments of a public university. In this role, he interfaced with the academic and the research stages of technology to identify new and viable commercial innovations. Often, this included reviewing collaborative research agreements with attention to nondisclosure and material transfer of confidential information on behalf of the university and its personnel.